Shorty Street need to get Natalie Medlock out of a nurses uniform and put her in a Yeti costume. And I’m not talking about the Comedy Festival proper. We Aucklanders have known this is hilarious for a number of years now. Auckland’s stand-up comic fraternity (anyone who has ever appeared on 7 Days, ever) have been on a renaissance roll for a while. No, I’m talking about comedy in the theatre. Something very hilarious, and very exciting, is happening on our stages. Over the last few years, the creation of the funny play has been taken up by three main creative groupings in Auckland. The Thomas Sainsbury juggernaut has been impossible to miss, the playwright churning out play after play (Talk, Dance Troupe Supreme, The Mall, Loser etc etc etc) and often directing his own work in small venues around town. And after graduating from Toi Whakaari, writer-performer pair Dan Musgrove and Natalie Medlock lit up the Auckland scene with A song for the Ugly Kids, The Giant Face, and Basement revolving cast Xmas shows Christ Almighty! and Toys. All share similarities, so much so that a distinctive ‘comedy’ theatre style is happening right now in Auckland. It is silly, outrageous, naughty, absurd, and anything but PC. The storylines are often ridiculous. Although sometimes gagging on popular culture, the heart of the comedy is squarely in the characters and their relationships. The plays are populated by larger-than-life characters (with actors as a rule playing multiple characters within a night) who underneath are deeply flawed and have a ‘truth’ that exposes our own human foibles. This, is what makes them work, and is something I have long admired in Sainsbury’s work especially. This week at the Basement, all three comedy-making groups converge. Thomas Sainsbury directs Nic Sampson and Joseph Moore’s play Space Race at 7pm. For Dan is Dead / I am a Yeti at 8:30pm, Natalie Medlock has eaten her writing partner Dan and goes it alone in a rather fetching Yeti costume. Sainsbury wrote the show with Natalie and Dan, and is one of her co-stars onstage. The shows are a great testament to this new generation of comic talent, and their coming together. 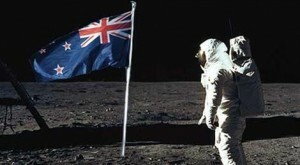 A kiwi on the moon? 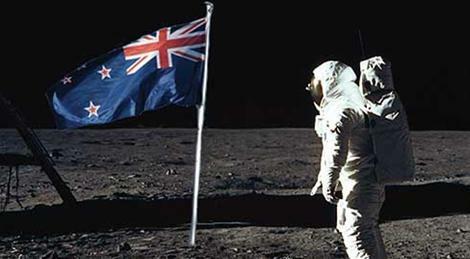 Space Race is an affectionate call back to old school New Zealand, where the she’ll-be-right-number-8-wire attitude sees Manawatu’s Laurie Marshall (Simon Ward) decides he’s going to build a rocket ship and get there before the Americans. On ya mate. Small town NZ is once again a feature in this show (a theme that I have already noted has popped up in quite a number of work this year including I won’t be happy, Joseph&Mahina, Well Hung), perhaps because a place where everyone-know-everyone feature makes good drama, and the locals are especially eccentric and colourful here. These locals are obsessed with making their hometown of Sanson, Manawatu relevant by ‘putting in on the map’. A visit by a big city Wellington radio man is just the opportunity. Ostracised inventor Laurie, played with an endearing gentleness by Ward, is the most normal of the lot despite being a grown man still living with his nanna, and his intention to fly to the moon. Nic Sampson and Joseph Moore are an appealing duo, providing many laughs as RSA patrons and donning headscarfs as members of the Woman’s group. Sampson is the commanding, energetic whereas Moore’s are cleverly understated characterisations – the dynamic works beautifully. Josephine Stewart-Tewhiu, who has been making her own contribution to the funny play genre with Isa Adamson (Chalk, Ruby Tuesday) rounds out the cast as two elderly characters (a conscious parody of her recent award winning turn in Chalk where she played multiple oldies?) and the de-facto love interest Kathleen- a young reporter with a working knowledge of rocket fuels. She shows her versatility yet again, but I wished that the writers had afforded her more to chew on. The humour is broad and silly, and the play is very much helped along by playing with the nostalgic images of a simpler 1960s NZ. It is a simple story, but like its hero Sampson and Moore just get on with it, telling the story well without forcing the funny. Dan is Dead / I Am a Yeti (directed by Sophie Roberts) is a different beast. 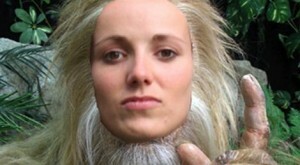 Natalie Medlock is Yeti, a cute and crafty creature that was driven out of Tibet by the Chinese (but not how you might think) and currently resides in a flat with new(ish)ly-weds Tom (Tom Sainsbury) and Yvette (Yvette Parsons). Yeti tells us she is an aspiring film writer, and tells the remarkable story of her life and troubles with her flat mates. It’s a whacky, far-out concept. And it works. This show had the best ratio of belly laughs to length that I can recall. Safe in the fluffy white Yeti suit (which still manages to show off Natalie’s shapely legs), Natalie can get away with ANYTHING. All three performers in fact are refreshingly without shame, and the show contains some rather entertaining gross-out humour and unfortunate seductions -- the show likes to push, and revels in the gasps of audience reaction. There really isn’t any other performer like Natalie Medlock. She is a wholly unique talent: charming, gorgeous, master of the silly voice, and willing to subject herself to all kinds of indignities. And did I mention she is beyond funny? Her Yeti creation is her best yet (topping even her headless character from A Song for the Ugly Kids), with an inherently funny accent, fantastic quirky mannerisms (like a small child, she likes to copy people), and a dangerous need to connect to people. Tom and Yvette are excellent supporting players as a married couple stuck in low paid and creatively unfulfilling jobs. To the play’s credit, the subplot involving their marital breakdown (helped along by having a Yeti living in their flat) is just as interesting as the Yeti’s main life story. The two actors also appear in several brilliant comic diversions including a Winz officer who has never heard of the PACE scheme (Tom), Sir Edmund Hillary (Yvette), and Dave Dobbyn (Tom). It would be unfair to give anything more away*. I absolutely loved Yeti, and I loved this show -- it was anything but abominable. Both Space Race and I am a Yeti showed a supreme confidence and comic flair. This generation’s comedy theatre makers have well and truly arrived and we are in good hands. Go and see them! Space Race and Dan is Dead / I am a Yeti play at the Basement Theatre until Sat 7 May. More information at the NZ International Comedy Festival website. Welcome to the blog… Rosabel Tan!